I love camping, coding, and coffee. Growing up on the edge of a forest in Wisconsin, I’ve learned to work hard and play hard. Designing experiences is my passion, and it’s where I spend my life. When I’m not designing websites, I’m designing board games or stage sets. An entry for The Game Crafter's resource game design contest, Ahoy! won a prize for best artwork. Ahyoheek is based on a fictional game-within-a-game in the world of the Myst games by Ubisoft. This deck design was approved by Ubisoft for limited-run production. 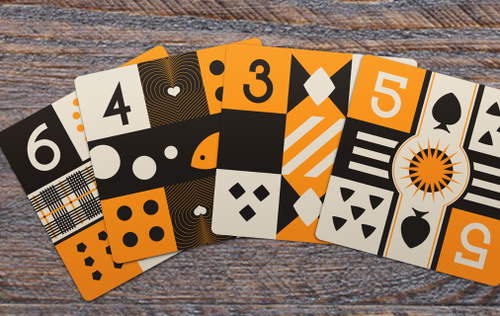 These square cards are from an unreleased concept deck based on American design from the 1960's, particularly inspired by Milwaukee legend Brooks Stevens.